The BNC connector (Bayonet Nut Connector) is a miniature quick connect/disconnect RF connector used for coaxial cable. 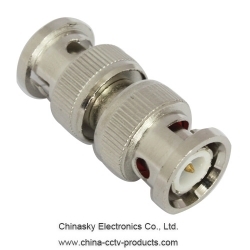 are ideally suited for cable termination for miniature-to-subminiature coaxial cable (e.g., RG-58, 59, to RG-179, RG-316). We often use BNC cable to transmit audio and video signal in monitors and audio equipments in the up-markets.